If you are a aventure fan, you are likely to go wild after playing the Big Game Hunter. 5-reel-slots and 3-rows power the game which implies there is never a dull moment while in action. 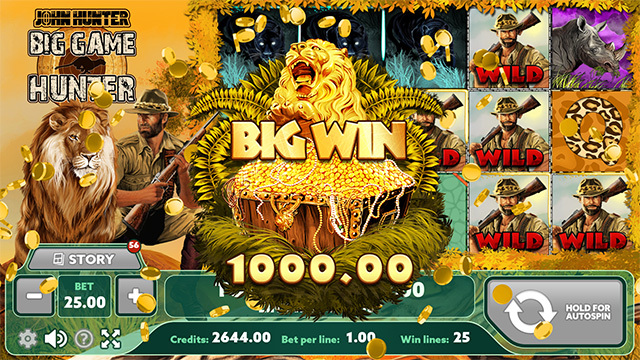 Furthermore, the 25-line video slot gives you incredible and engaging wild themes. The first thing that is likely to impress you is the design of the game. It is not only user-friendly but just generally a joy to use and navigate your screen efficiently, hence suitable for all slots enthusiasts over 18 years of age. When you push the spin button, the five reels are multiplied by three columns to create a grid of symbols which organize into predetermined pay lines for a win. 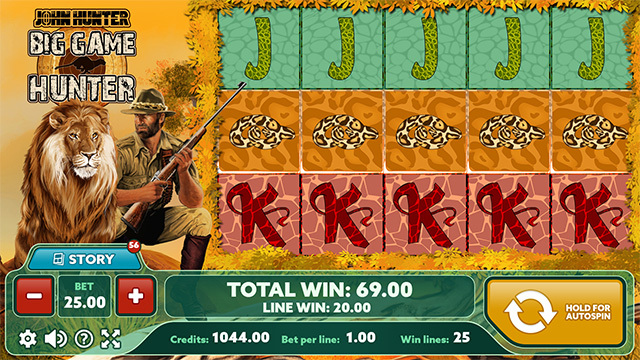 The Big Hunter Game features a standard 25 pay lines. Keep it in mind that you will get paid only the highest win per bet line. What should you expect from the game? Immediately the reels stop spinning some symbols will appear on the screen. Usually, when three or more distinct Scatter symbols appear anywhere on the reels, a Free Spins bonus are activated. Whenever 3, 4 or 5 spin symbols occur on your screen, you will get awarded 10, 20 or 30 free spins respectively. You will be paid for your winnings with a particular multiplier on wins. That means that the payouts of winnings can be doubled, tripled or quadrupled. The Big Game Hunter has two mini games. The mini-games appear on your screen when you get multiple bonus symbols after the reels have stopped spinning. Whenever three or more lion bonus symbols occur anywhere on your screen after the reels have stopped spinning, it implies you have reached a hunt mission. 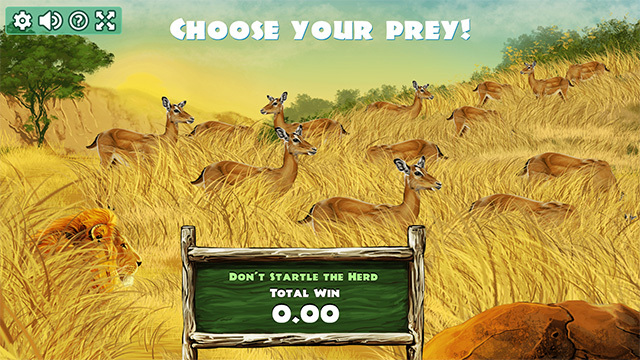 A mini game will appear on your screen taking you to grassland filled with a herd of antelopes. The game will automatically give you the lion’s symbol character. You will have to eliminate the antelopes by steadily hunting them one after another. You should avoid quick involuntary movements which might frighten the herd and make them run away from the field. At the end of the mini game, you get some amount of credits award depending on the animals you managed to eliminate. After the reels have stopped spinning, three or more crocodile bonus symbol will appear on your screen. That is an indication that you have reached a premium mini-game which requires you to jump from one stone to another until you cross the river. 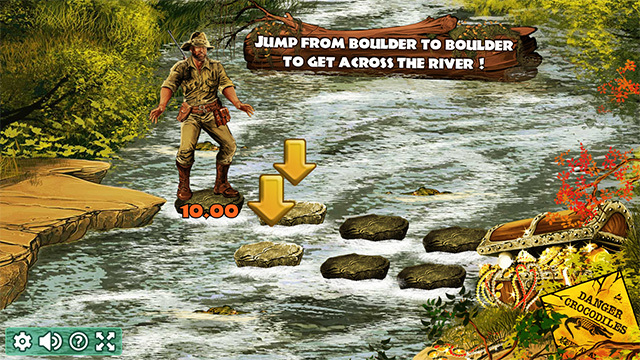 Notably, as you cross the river, you should be extra careful to avoid attack from the two crocodiles, critically located on both sides of the stones bridge. As you jump from one rock to another, a dialogue box will appear on the screen telling you to click multiple times to balance. When you successfully cross the river to the other end, you will get the award bonus. Big Hunter Game has incredible graphics with the five transparent reels featuring the legendary forest animals that play different sports. The game has an exciting, entertaining animation throughout as you make deadly movements in the mini-games. The reels can feature a panther with scary and glowing amber eyes. Most jungle animals have striped fur which blends in with the trees. In the game, the lion has razor sharp teeth and powerful legs. The surprising aspect of the game is the roars and growls of the jungle animals which are indeed terrifying. 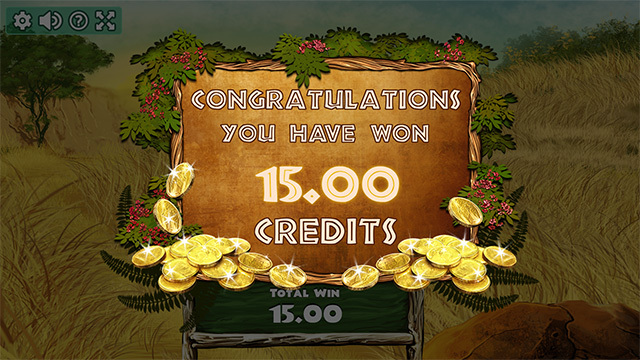 In the mini-game and bonuses, you are likely to move between the dense vegetation. The game has poisonous creatures and large carnivores such as snakes and crocodiles which of course, is quite entertaining. The soundtrack accompanying the video game combines simple melodic tunes with familiar traditional beats. 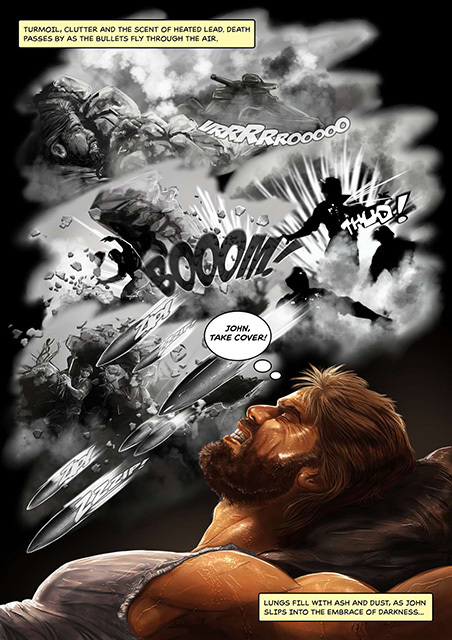 The soundtrack changes depending on the actions of the player. For instance when you win bonuses or free spin. The game audio will make you have an abstract relationship to reality with a significant connection to the world of everyday life. Since Big Game Hunt is an adventure game, you will enter a magical world where you will create the images and sounds of the world in your imagination. Occasionally, you will hear the hums and chirps of insects, the song of birds and the calls of mammals. The game audio introduces the physical, temporal, environmental, emotional, and ethical dimensions of the Big Game Hunter. Be prepared for countless hours of jungle entertainment graphics. Big Hunter Game is one of the most enjoyable adventure games out right now. The Big Game Hunter will be launched on 18/09/2017 at the Cyprus Gaming Show 2017. During the 2017 Cyprus Gaming Show, Playpearls are also going to start a unique bonus with nearly all the new games including the Big Hunter Game. You should capitalize on this opportunity and attend the two-day conference event for gaming professionals which will give you valuable insights on the gaming sector. Stay in touch for updates about this new bonus for the Big Game Hunter. The game features NEW in a game comic book, allowing the player to follow and in enjoy the story and the Casino Operator to reward the enthusiastic adventure fans!